Cardiff University’s MA programme is the oldest of its kind in the UK and one of the most impressive in the country. Designed for both experienced and inexperienced writers, it places great emphasis on helping its students produce work of the finest quality possible. 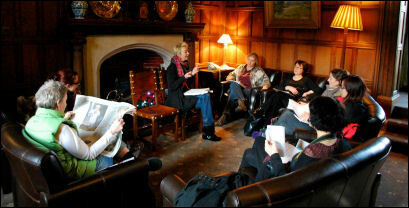 The course is also notable for the high calibre of its varied roster of visiting writers. In the past this list has featured Rhian Edwards, the current winner of the John Tripp Award for Spoken Poetry and whose collection, Clueless Dogs, was awarded Wales Book of the Year 2013; Gwyneth Lewis, the inaugural National Poet of Wales; Tessa Hadley, an acclaimed novelist and short story writer who has contributed to both The Guardian and The Independent, and Lindsay Clarke, whose novel The Chymical Wedding won the Whitbread Prize in 1989. A notable addition to these names is James Smythe, who has contributed to the MA as a visiting writer, in addition to benefiting from it as a graduate. Smythe is the author of several acclaimed novels, including The Testimony, which won the Wales Book of the Year Fiction award. He now teaches Creative Writing himself in London, and also pens an ongoing series of articles for The Guardian, entitled “Rereading Stephen King”. Joining Smythe, other notable alumni of the MA include Samantha Wynne-Rhydderch, whose collection of poetry Not In These Shoes was shortlisted for the Wales Book of the Year Award, and Holly Howitt, who also completed her PhD from Cardiff University in 2008, and is the prize-winning author of The Schoolboy, Exposure and Dinner Time and Other Stories. Indeed, the quality of the programme can be gauged by the quality of the successful writers drawn to it; whether to study, give a lecture or reading, or to teach. The course is headed by Dr. Richard Gwyn, whose memoir The Vagabond’s Breakfast won the Wales Book of the Year Award for Creative Non-Fiction, and who teaches alongside Shelagh Weeks, Tim Rhys, Tristan Hughes, Damian Walford Davies, and the Trust’s own Clare Potter and Christina Thatcher – all highly successful and published practitioners. As attested by many of its alumni, not only is the MA is renowned for its intense emphasis on the quality of its students’ work, offering engaging workshop sessions that focus on technique and craft, but for its critical engagement with the ‘Creative Process’; through which both the practical and theoretical problems facing writers are explored. But its the programme’s ‘Teaching Creative Writing’ module, which truly sets Cardiff University’s Creative Writing MA apart from the herd. In this module students are introduced to a diverse range of teaching practices, get to observe a Creative Writing undergraduate class, and even teach a session of it, planned by themselves. They are also are encouraged to offer their developing skills as writers and teachers to the local community. As part of the MA, students frequently visit local schools, or accompany their students on writing trips to sites such as St Fagans National History museum. The course also encourages socializing between students beyond the university classroom, and every three weeks during the course there are ‘open mic’ events. After a reading from that week’s visiting writer, the students then read their own work; an opportunity which is often followed by lively discussion with each other, over a pint afterwards. Every year the students are also whisked away to a writing retreat at Gregynog Hall, a beautiful country mansion in mid-Wales, entrusted to the University of Wales in 1960. There, the students are free to roam the grounds and let their surroundings inspire them – in-between the scheduled workshops and evening readings, of course. Past retreats have also included a literary tour of Dublin and a week in the idyllic setting of Ty Newydd, the writing centre in North Wales. The collaborative spirit of Cardiff University’s Creative Writing MA does not fade away upon completion, either. Alumni of the MA have been known to carry on their support of each other, through continued contact and workshopping. Such a trend is truly a testament to the powerful bonding experience, between a likeminded group of people with the same interests and passions, the MA can provide. The current incarnation of Creative Writing MA students at Cardiff University are looking to self-publish an anthology of their work. Meanwhile the next crop are no doubt fervently anticipating their encroaching year of study. Just as the rest of us anticipate the work that will emerge from them in years to come. I’d love to do an MA in Cardiff (especially as I did my undergrad there) but unfortunately they don’t offer a part time option and I need to keep working.